It’s early Sunday morning, around 8 o’clock. On my way to vegging out on the sofa before the TV, I stop by the fridge for a plastic container of red peas. It’s been soaking overnight. I drain it, dump it in a pot with plenty tap water and put it on the back burner of the stove to boil. 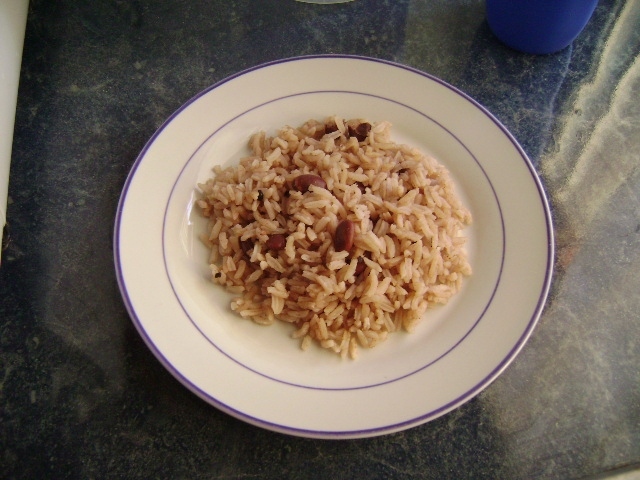 In JA, when anyone puts on a pot of red peas on a Sunday morning, it’s likely for rice and peas. Any other day of the week and it could be for stew peas or pea soup. Red peas take long to cook; so, I prefer to boil a big pot ahead of time, portion out and freeze the excess. Now, my fellow Jamaicans and Jamaican aspirants, I’m not boxing bread out of tin-food manufacturers’ mouths, BUT it’s better to cook your own red peas. The peas-water is browner and richer than what you get from a tin, and you can flavour it exactly how you want it. Tin red peas is for lazy people. Hold on, hold on! Put down back dat ting yuh going throw at the computer screen. A said, please to put it down! Don’t be roughing up the country girl (who migrated from the city). Once in a while, I feel lazy too. So I’m not knocking lazy people, per se. I also think tin peas is for people who have money to spend on peas that somebody else—who you don’t know—cook and charge you extra for. Again, mi not knocking anyone because, once in a blue moon, I’m also tempted to splurge on tin peas. But then I consider how much more my money could stretch if I buy the dry peas and prepare it myself. My foreign dwellers, don’t make me make you feel guilty for picking up tin peas. I am aware of the challenges “ethnic” people face when searching for fresh “ethnic” ingredients in faraway lands. If you long for likkle rice and peas to sweet up yuh mouth and all you can find is tin peas, by all means, pick up the tin peas from off the shelf. There are a few decent brands out there. Anyway, back to my Sunday story. Since I’m in the kitchen, I decide I might as well season the fowl. I haul out a tray of chilled parts, wash them, season them in a Pyrex dish or plastic bowl (whichever is available), stash it in the fridge-bottom, and I’m off to laze and sleep-and-wake in front of the TV. It’s been quite a while since I’ve seasoned chicken overnight. Why? Cyan bodda. But, trust me, my way still gets the seasoning right down to the bone. In Jamaica, tasty bones are a sign of culinary prowess, as is shelly rice and peas. On Sundays, dinner is usually served earlier than any other day of the week. Some Jamaicans start cooking before they go to church and finish off when they reach home. Others start by noon and are ready to eat by mid-afternoon. To me, Sunday-dinner prep shouldn’t be a whole-morning or afternoon event. The less time in a hot kitchen, the better. That way, you’re not too tired, hot and bothered to enjoy your cooking with the rest of the family. Over the years, I’ve gotten Sunday-dinner prep down to an art. Two hours total, tops! My Sunday dinner usually consists of rice and peas, fried ripe plantain, baked chicken and gravy. Vegetables digest quicker than heavy starches and proteins; so, those are consumed prior to the main meal. It’s a principle learned from a Rastaman. Or was it a Seventh Day Adventist? Whichever one, it has proven to be an excellent principle for efficient digestion and minimization of wind production later in the evening. Instead of chicken, some Jamaicans do escovitch fish, a meat substitute, roast beef or roast pork. You know how I feel about pork already. But if you and Trent have no fuss then go ahead, roast him up good. For those of you who have never had a typical Jamaican Sunday dinner or who haven’t had it since moving from under your parents’ roof or becoming empty nesters, my challenge to you this weekend is to prepare an authentic Jamaican Sunday dinner. Let’s keep tradition alive! Sunday dinner is cozy and comforting. Invest a little time in preparing one, and your belly will thank you. For those who live alone, you may be saying, “But is me one live.” No excuse. You are s’mady too. Treat yourself. Wipe down the dinner tray, put it in front of the telly, set your knife and fork and serviette and take pleasure in something other than fruity loops and condensed milk this Sunday. To help out, I’m sharing my ingredient lists for baked chicken and rice and peas. Pardon me, again, for not giving recipes. When cooking, I don’t measure, scientifically. Most times, salt and powdered seasoning are “measured” in my palm, and the amount of natural seasonings used depends on what looks right in the bowl or pot. For the readers, who aren’t so seasoned in the kitchen, if the food doesn’t turn out exactly how you want it, try again next Sunday until you discover the formula that works for your taste buds. I think I can safely say that most Jamaicans fumbled the first time we tackled this mighty tradition. My Sunday-dinner baptism happened with my sister. One weekend, our mother was out of town and hadn’t returned yet. What were we to do, eat the usual teenage-menu options of pancakes, eggs, toast bread and Chiffon margarine? Definitely not on a Sunday! Well, the baked chicken neva turn out too bad, but the rice and peas wasn’t looking like Mum’s own. We tried cooking it longer and longer . . . and longer until we finally decided to turn off the stove, share out the dinner and eat the tough peas. Cho, wi did hungry! Anyway, beautiful people, tell me how your first try goes or share your culinary expertise and favourite Sunday-dinner choices with us. Would love to hear from you. And, by the way, I’m now tweeting! Yes, indeed! It helps to have a younger brother, who is modern. Follow me @snapshotsjalife for alerts on the latest posts and fun nuggets on days when I’m not blogging. Should resemble this when you’re done. Notice the peas to rice ratio. 1. After draining peas, cover with fresh water in a pot, add one or two good pinches of pimento, cover pot and simmer until peas are al dente (roughly 1 hour). Ensure liquid doesn’t drop below the volume of the peas during cooking. 2. Remove pot from burner and carefully scoop out extra peas and cooking liquid to save for future use. 3. Season what’s left back with scallion, thyme and salt. Add coconut milk or plain water to top up the liquid in preparation for rice-cooking. Use cooking instructions on rice package as a guide to the amount of liquid. Simmer, covered, for about 15-20 minutes to allow seasonings to cook through and flavour the liquid. You may add a pat of butter towards the end of this stage. 4. Stir in rice. Drop in scotch bonnet pepper. 5. Bring pot to a boil, allow liquid to reduce until barely above the mixture. Reduce to low heat, cover pot and leave it alone! Allow it to “steam” for 15-20 minutes, turn off heat and let sit for 5 minutes. If you’re using brown rice, follow cooking and resting times on the package. 6. Fish out scotch bonnet pepper, scallion and thyme, fluff and serve. Baked chicken served with roasted sweet potatoes and a slaw of shredded cabbage, carrots and raisins. Note: Use any other seasoning you wish. 1. Early Sunday morning or the evening before, mix all seasonings/condiments together with a small amount of oil to make a thin paste. We want the seasoning to stick to the chicken, so the marinade shouldn’t be too runny. 2. Add chicken parts to marinade and give them a good one-minute massage, so all pieces are coated well. 3. Cover and set aside in the fridge until Sunday afternoon. 4. Pre-heat oven at 400 degrees F.
5. Remove pieces of natural seasonings (thyme, scallion, onions, garlic) from the chicken to prevent burning during baking. Reserve marinade for gravy. 6. Place chicken parts on a baking tray, so they aren’t touching. I drizzle a little bit of oil over the chicken at this stage for added flavour and colour. 7. Bake for about 40-45 minutes. Longer than that and you may be entering bone-dry, stringy-chicken territory. You may turn pieces during cooking to ensure all sides are nicely browned. 8. To make gravy, boil any leftover marinade for at least 5 minutes. Add water, broth or other flavourful liquid if needed. Skim fat from chicken drippings and add to pot. Adjust seasonings. Simmer until liquid reduces and thickens slightly. Use cornstarch to help thicken if necessary. Serve slices of fried ripe plantain, a fresh salad and a natural juice of your choice with your Sunday dinner. The traditional juice is freshly made carrot juice blended with lime or condensed milk, nutmeg and vanilla. Cutting down on fried foods? 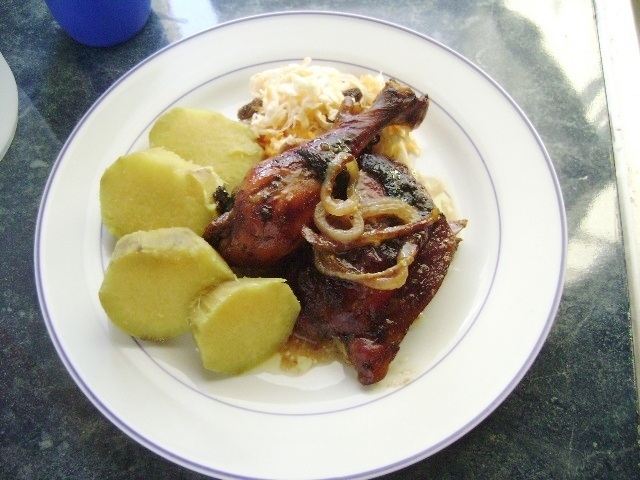 Try baking the ripe plantain in its skin while the chicken is in the oven. Don’t feel for rice? Try baked, whole sweet potatoes; boiled, sliced yams; roast breadfruit; or boiled green bananas in place of rice and peas. Still yummy. Still very Jamaican.